Are you a fan of German designed and engineered instruments? If you are, you will fall in love with the Zeiss Conquest HD 10x42 Binocular. Crafted by arguably the most respected manufacturer of optical instruments, this binocular will conquer your heart with its impressive features. Also, this great German import epitomizes all the design qualities that we have come to expect from German engineering. Although it is not the cheapest binocular out there, it is one of the best in regards to performance and durability. The versatility and outstanding performance of this binocular make it ideal for long hunting trips. Also, this Zeist model is a fabulous optical instrument for spotting birds in their natural habitats. To understand, why this is a great binocular, below is my honest and unbiased review of it. At the core of the Zeiss’s extraordinary performance is a revolutionary lens system that relies on HD lenses. The latter lenses are made from high-quality HD lens glasses and deliver unrivaled picture clarity. Whether you are a birdwatcher or a hunter, the optical precision of this pair of binoculars will blow you away. Personally, I think there is no binocular that is better than the Zeiss conquest HD when it comes to clarity. It is for this reason that I always carry a pair of Zeiss Conquest HD 10X42 binoculars whenever I go out to explore the wonders of nature. When I first held the Zeiss Conquest HD binocular, I was surprised at how lightweight it is. Actually, I do not believe that I have found a binocular that offers a better combination of portability and performance than the Zeiss Conquest HD. After doing a bit of digging into its weight, I found that it weighs less 30 ounces. This means that the Zeiss Conquest HD is perfect for bird watching and long hunting trips. Another thing that makes this binocular a sure winner among bird watchers and Hunter is its rotating and lockable eyecups. These eye cups can be adjusted to accommodate the needs of both eyeglass wearers and non-glass wearers. The ingenious design of these eye cups makes them easy to adjust. Thus, adjusting involves rotating the eye cups and locking to your preferred distance. In this respect, the Zeiss Conquest HD is not only powerful but is also comfortable to use in all kinds of conditions. 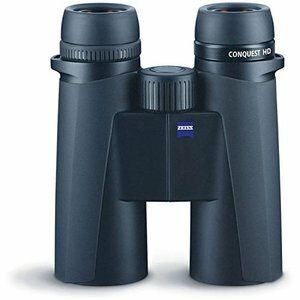 Zeiss uses only the best materials in the construction of its binoculars, and the Conquest HD is no exception. The aluminum body is wrapped in a solid rubber armor while the lenses are coated with a special coating that protects it against the vulgarities of weather. The roof prisms are streamlined and durable for improved performance. A large focus wheel located between the two eyecups makes adjusting the binocular barrels easy. The barrels are filled with nitrogen to prevent internal fogging while the optics are sealed with o-rings to prevent dirt particles from entering the binoculars. What accessories does this binocular come with? Answer: When you buy this Zeiss model you get a strap, case, lens cover and lens cloth. Can this binocular be mounted onto a tripod? How does this binocular compare to the Zeiss Terra Ed? Answer: The Zeiss Conquest HD boasts of a superior build quality, which makes it look and feel more high-end than the Zeiss Terra ED. Costing just under $1000, this pair of binoculars is the perfect spotting instrument for anyone who is serious about investing in a quality binocular. The Zeiss Conquest HD has everything that you would expect from a binocular in its price range. In conclusion, there is no binocular on the planet that can rival the Zeiss Conquest’s image quality and engineering. Thus, it is one pair of binoculars that would make a great addition to your portfolio of binoculars.